I wanted to teach myself all about QR Codes, so I figured the best way to do it was to build a QR Code generator from scratch, in assembly language, on a vintage computer from the 1980's. Why not? Full details and downloads in the AtariAge forums. I put together a simple Google Chrome Extension to toggle Chrome's image antialiasing. The antialiasing was causing very fuzzy images with the Js99er.net Texas Instruments 99/4A vintage computer emultator. "What is the longest sequence of letters for which all permutations are anagrams? I can think of "on" and "no" which has length 2." I wrote a simple Java program that loads the Mac OS X dictionary and iterates through all possible anagram permutations. The answer to Wayne's problem was "3" (the words "ree", "ere", and "eer"). Recently, a programmer created a web browsing application for the TI-99/4A 1980's era computer. Because computers of this time had extremely limited memories and processing speed, his browser was not physically capable of decoding more modern HTML, so he created a new, very simplified markup language called 99ML. 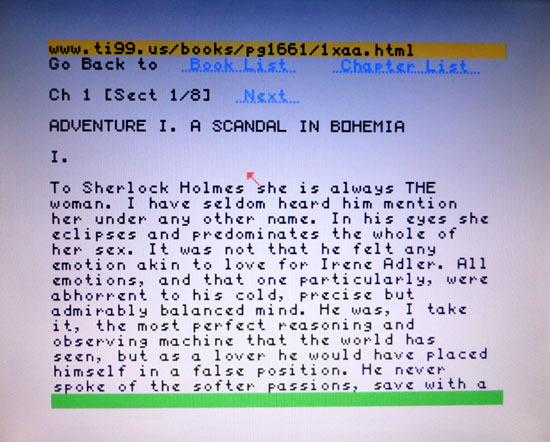 I thought it would be fun to create a 99ML-compliant page, so I took an ASCII copy of a Sherlock Holmes story from the Project Gutenburg site, and did a bit of text parsing magic with various Linux commands to create the 40-column, 99ML files for the browser.